There are plenty of ways to celebrate Mother’s Day with live jazz on Sunday. Jazz 98.5 FM, WSAX-LP is holding a second weekend fundraiser at The Idle-A-While on the East Side (see more below) which wraps up with a Mother’s Day doubleheader on their House Restaurant stage Sunday with Anna & The Consequences playing for brunch from noon to 4pm and vocalist Shaun Booker showcasing her jazzy side for dinner from 6 to 10pm. Admission is free, donations are graciously accepted at the door, and making reservations at the venue’s website is strongly encouraged! Also on the eastern side of the county, pianist/vocalist Vernon Hairston will be serenading mothers over great Southern comfort food at Family Affair Cafe in Groveport from 4 to 7pm. Finally, a special installment of Barcelona’s weekly Sunday dinner show will feature Jeff McCargish playing nylon string acoustic guitar from 6 to 8pm. Happy Mother’s Day to all the moms out there! 98.5 FM will be remote broadcasting from The Idle-A-While on Friday and Saturday nights. There will be plenty of live grooves to be had, with Urban Jazz Coalition playing Friday at 8pm and NexLevel playing Saturday at 6pm, and another band may be added for Saturday night. As station manager Ron Johnson told me, “This is the second event to raise the funds to purchase and install the equipment we need. The first event was a good first step as with the generous contribution of The House/Idle-A-While and other donations, we were able to purchase our transmitter. 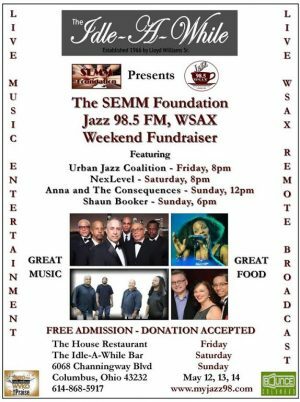 We hope with this event we will be able to purchase our new antenna system.” Hopefully you can attend one of their shows this weekend to support Columbus’ jazz radio station, but remember that you can always donate online here. Saturday, May 13th (3 – 6pm): Second Saturdays with Sonikora featuring Chatoyant at The Vanderelli Room, Franklinton. This monthly event focused on improvised music welcomes Chatoyant, a Detroit-based free jazz/psych-rock band, as its featured guest for May. Formed in 2013 by an unlikely mixture of noted area musicians active in numerous rock, noise, and improvised music outfits, the “unique sound and intensity” of this instrumental quartet soon earned them a regional cult following. Consisting of Matthew Smith (guitar), Joel Peterson (Rhodes), James Baljo (drums), and Marko Novachcoff (woodwinds), Chatoyant is currently on a national tour and is preparing to release a double LP in 2017. The afternoon will open with a new Columbus quartet of Caleb Miller (saxophones/keys), Eli Chambers (bass), Hasan Abdur-Razzaq (saxophones) and Gerard Cox (drums/piano), continue with Chatoyant, and end with Sonikora contributing their own multi-genre cosmic flights. Admission is on a sliding scale of $5 to $10. Sunday, May 14th (3 – 5pm): MAC Chamber Orchestra: “Symphonic Jazz” at the McConnell Arts Center. Details from the MAC: “The McConnell Arts Center Chamber Orchestra, under the direction of its founder, Antoine T. Clark, will explore ‘symphonic jazz’ on the final concert of the 2016-2017 concert season. ‘Symphonic jazz,’ a term coined early in the 1920s by jazz band leader Paul Whiteman, is a fusion of European Romantic tradition, African-American jazz, and American popular music. Darius Milhaud’s symphonic jazz ballet ‘La création du monde’ and George Gershwin’s ‘Rhapsody in Blue,’ two popular examples of music dating from the early years of this experiment in modern music, are featured on this exciting program. Ragtime, a progenitor to jazz, with its restless bustle and high rhythmic energy is also featured through three Scott Joplin tunes arranged by the American music master, Gunther Schuller. International soloist and beloved OSU piano professor, Caroline Hong, will feature as soloist on Gershwin’s ‘Rhapsody in Blue. '” Intermission music will be provided by the Caleb Hutslar jazz trio. Tickets are available here and are $30 at the door, $15 for students for this entertaining and educational program. Thursday, May 18th (9 – 11pm): An Evening with Pierre Bensusan at Natalie’s. French-Algerian guitarist, singer and composer Bensusan, once described by the L.A. Times as “one of the most unique and brilliant acoustic guitar veterans in the world music scene today,” plays a style at times characterized as Celtic, Folk, World music, New Age, or Chamber Jazz. Known as a master of contemporary acoustic guitar, his latest triple live album Encore won an Independent Music Award in the Live Performance Album category. Seeing this artist in one of the area’s finest listening rooms should be quite the experience. Tickets and more info are available here.